We travel on Santos Travelmaster 26alu. Santos is a specialized Dutch brand. Our customized bikes have no chains, but Gates belt drive, no derailleurs but Rohloff Speedhubs, hydraulic Magura HS33 rim brakes, Schwalbe Marthon Supreme tyres, Cane Creek Thudbuster ST seat posts and Brooks leather saddles. Both bikes have Tubus carriers (rear), Frans has a front set as well, with an extra bike stand attached to it for stability when parked fully loaded. We decided to wear bike helmets a long time ago. Some may think this a bit exaggerated, but our own experiences have convinced us. It can save your life! 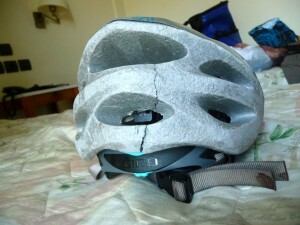 Besides that a helmet serves well as a sun hat, quite necessary in the hotter parts of the world. 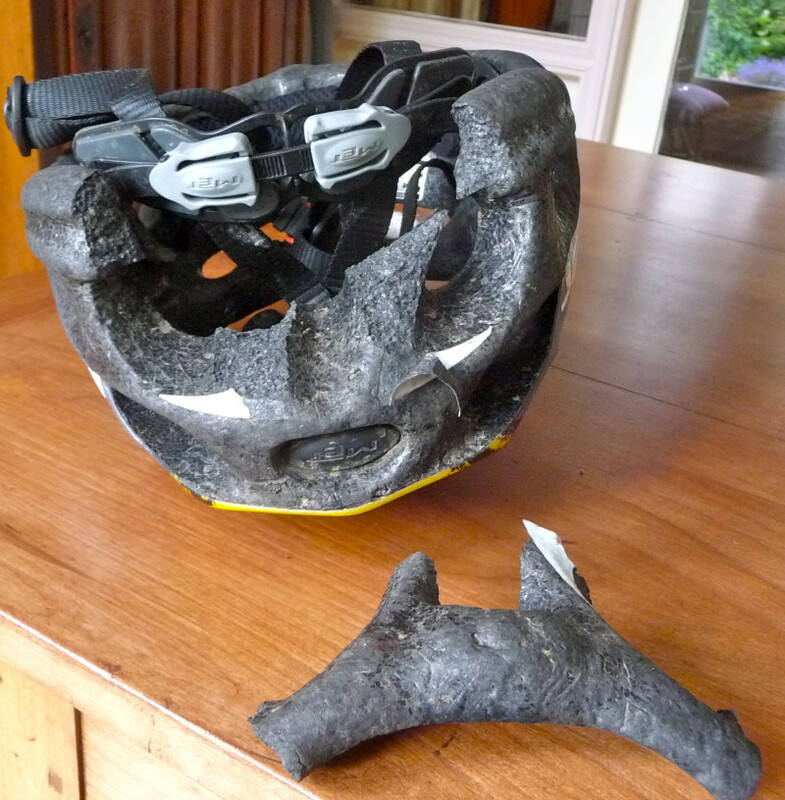 In order to show that wearing a helmet is not a bad idea at all just have a look at the photos of both Frans’ and Eveline’s helmets, both after a crash. Imagine that our skulls had had to absorb the impact instead. 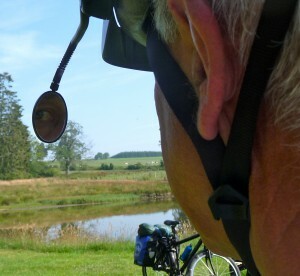 Frans has mounted a rear view mirror on his helmet. 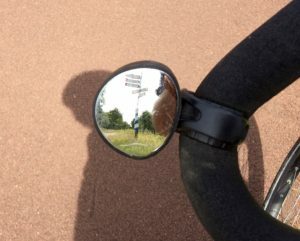 Or a small mirror on the the handlebar. Adds to security! Panniers: Ortlieb. Eveline has two rear panniers. Frans has those plus two front panniers, only in use when carrying camping gear. These panniers are waterproof. Both of us have waterproof Vaude handle bar bags. 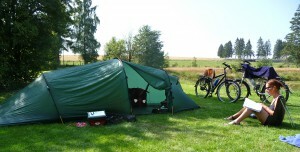 We camp in a Hilleberg Nallo 2GT tent with footprint (extra ground sheet), 3,2kgs. We sleep on lightweight down-filled Exped mattresses (Downmat UL 7, 52 x 180 x 7 cm, 565 gr.). As we like to sleep together in a double bed the mattresses are inserted in a 2-person Thermarest Duo Iso sheet bag to which a down blanket-shaped sleeping bag is zipped (Lowland Ranger Featherlite, 210 x 160 cm, 1100gr.). There’s nothing like sitting by your tent on a nice evening, enjoying a good drink, a book, an intelligent conversation or just stare at the horizon. What often lacks at such moments is a chair with a decent back to lean against. 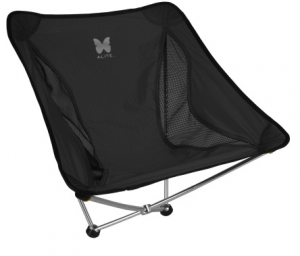 We have the next best thing, we are sitting on a Monarch chair and a Helinox one. Both light weight alternatives for a sore back. 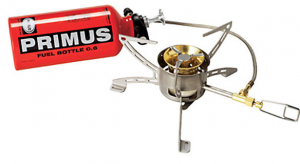 Cooking: Primus Omnifuel stove. A stove that can burn all kinds of fuel: gas, white gas, car petrol, gasoline (Diesel), kerosine etc. 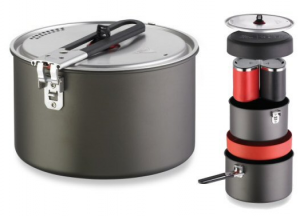 Pots and pans: MSR Quick2-system Two pots, 2 dishes, 2 insulating cups. 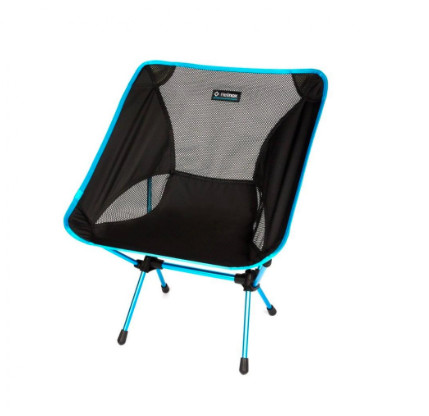 All camping equipment together weigh less than 10 kgs. 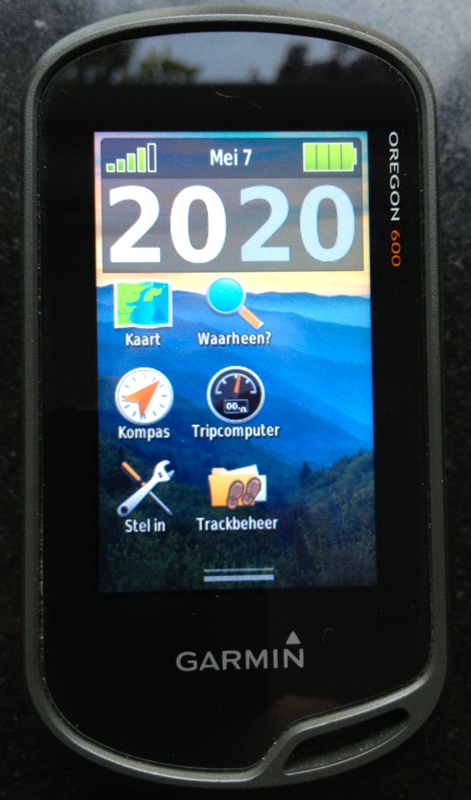 GPS: Garmin Oregon 600. It allows us to check our location (still cannot do well without good old printed maps though). Via the map builder in f.i. www.mapmyride.com I very often plan the routes for the next days. It shows cyclable roads, distances, profiles etc. and allows all this to be saved in a gpx.file that can be downloaded into the Colorado 300. Thus you will always find the right way. Furthermore I make track-logs every day. 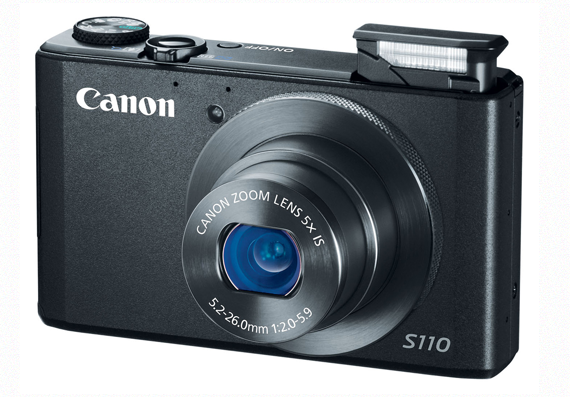 Photo’s: Canon Powershot S110. 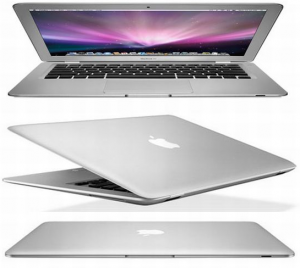 Very convenient (easily fits in your pocket), great features, one of them the possible of saving RAW-images. Still have to find out how to use though. We have our smartphones with us, a tablet and a laptop (1028 gr). In the majority of the accommodations we use, like hotels, guesthouses, campsites (in Europe) and private houses, there is wifi available. In places where there is no wifi, and there are still some of those, we mostly get on to the internet via a hotspot connection with the smartphone. Make sure you have a local sim-card with a sufficient data-pack (min. 1 GB/month). In this way the smartphone is a good navigation tool as well. A lot of our equipment is powered by electricity. 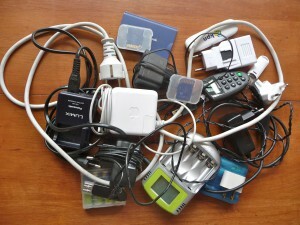 Imagine the mess of adapters, connectors, cards, identifiers and chargers we carry with us: app. 2 kgs all together. Don’t forget to carry an extension cord with a multiple socket, as in many accommodations wall sockets are scarce. A Nobel-prize for the one to come with this one universal charger, asap please.